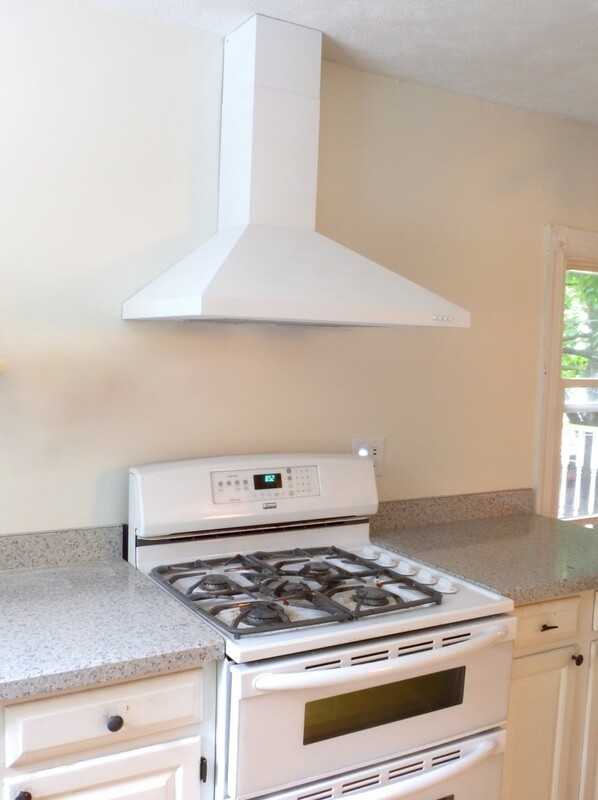 Isn’t it funny that affordable wall-mounted range hoods so often only come in stainless now? It used to be the most expensive. So what do you do when you don’t like stainless and your appliances are white? 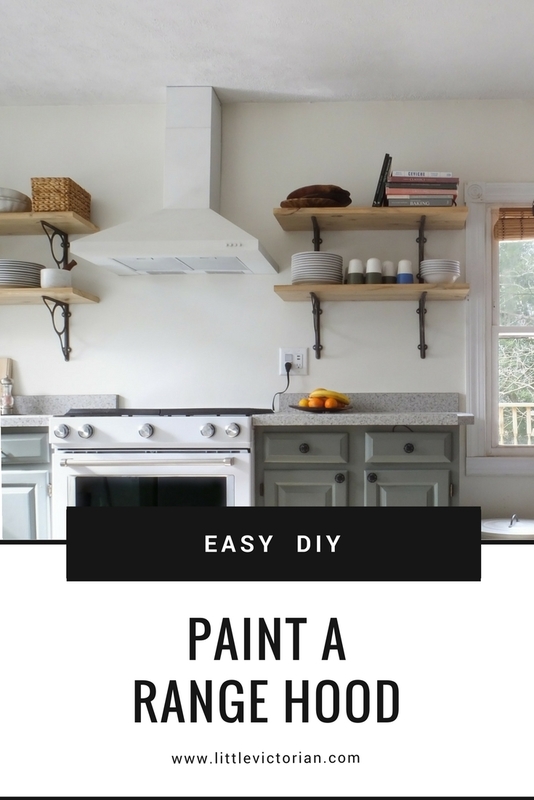 You paint a range hood. We purchased ours from IKEA, but they don’t sell that one anymore. There’s a similar one on Amazon. At first, we tried Rustoleum’s Specialty Appliance Epoxy which claimed a smooth factory-like finish. We followed the directions on the can exactly. And it was horrible. Terrible, awful, ugly. A lumpy, bubbly, bumpy mess. So before it dried, we had to wipe it ALL off with mineral spirits and head back to the store. Cover and tape off the sensitive parts of the hood like the vent and light sockets. Spray the hood with a spray primer. The primer was such a gorgeous earthy gray that I hated to cover it up. But of course, it had to be done. Let the primer dry for 24 hours. Spray paint the hood with high-quality enamel. So it was as easy as spray painting and really affordable! I would recommend waiting at least 24 hours to install after painting it to give it time to cure. The finish is so nice and smooth, and it cleans up very easily with a slightly soapy dishcloth. We’ll see if it needs any touch-ups in the future, but I’m pretty optimistic about it, it has held up very well so far to being carried back and forth from room to room during the past couple weeks of remodeling, and installation. Update: it held up perfectly, and still looked great until we sold the house 3 years later. And I cooked and used it daily. We would totally do it again! What a work! But it really looks good now. 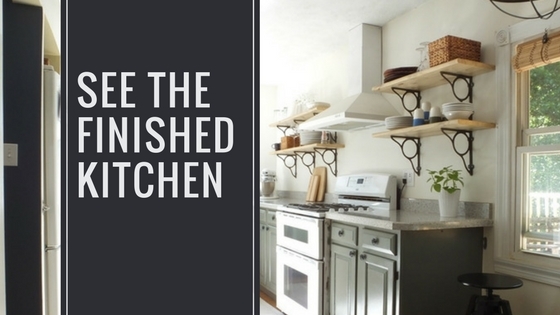 I liked it in stainless steel too but I get that it does not really go with your rustic look in the kitchen. Thanks, I thought I was the only one in Blogland not to love Stainless steel in cottage kitchens. Nope, we’re with you, we like the white! I love white for furniture in the kitchen, but I prefer the stainless steel appliances for my own kitchen. Although we have a supercheap kitchen with supercheap appliances in…white. 😀 And after cooking in it for 7 years I really get tired of looking at it. 🙂 I’d love to have such range hood from Ikea too (mine is little and really ugly). 🙂 But I totally love the way how you handled it and how it turned out, it looks fab!! The kitchen is coming along great Christina, great job!! How has it held up over the years? I am not a fan of stainless and would love to do something like this. It held up beautifully Liz! There wasn’t a single chip, scratch, or mark when we moved out after 3 years. I washed it regularly with a soapy dishcloth like I would any hood. So glad I came across this! I was thinking about doing the same thing and was afraid it wouldn’t work. 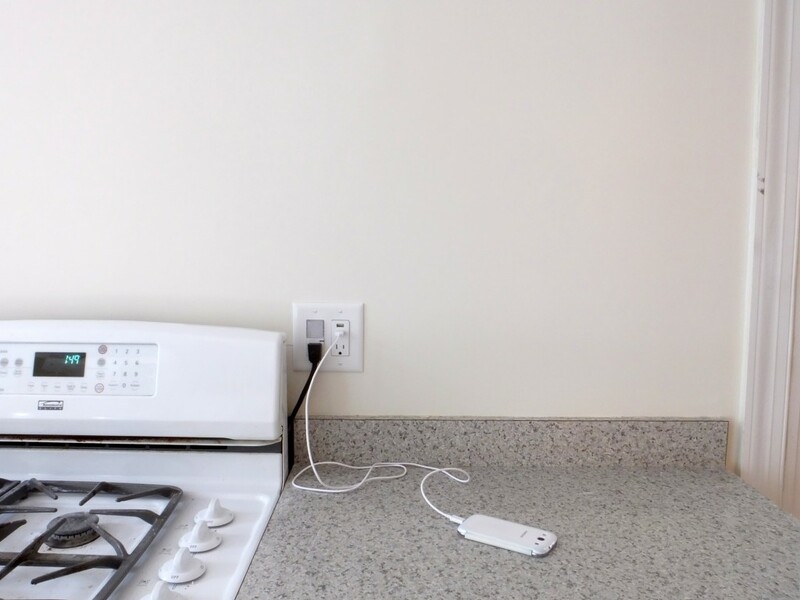 We also have white appliances, because we prefer it over stainless. We have a rustic cottage decor and felt stainless wasn’t warm enough for the look we wanted. I’m off to the store. Thank you so much for sharing. Yay! I’m glad you came across it too then! It’s a shame they don’t give us more options for range hoods. I have always preferred white. I hope manufacturers take heed and offer something other than stainless. I asked this question because I’m looking for an island range hood. I did see one in red, but very,very pricey. I can’t afford it but I’d prefer red as an accent to stainless. I am SO happy i find this article !! 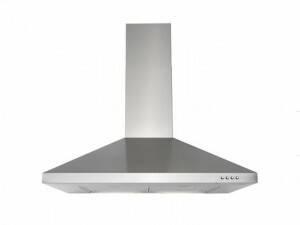 I was looking for a Broan-Nutone Chimney Hood in White but it’s 625.00 CA without taxes. Fortunately, I found one on craiglist at for less than half the price but … in stainless steel. I am glad too to see that I am not the only one who loves so much whites appliances in the kitchen ! 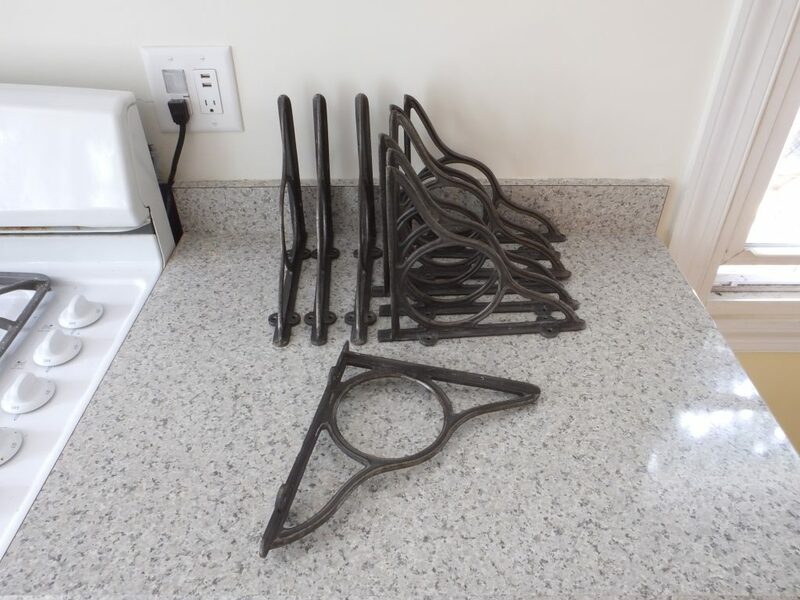 Did you sand (a little) your range hood before ? 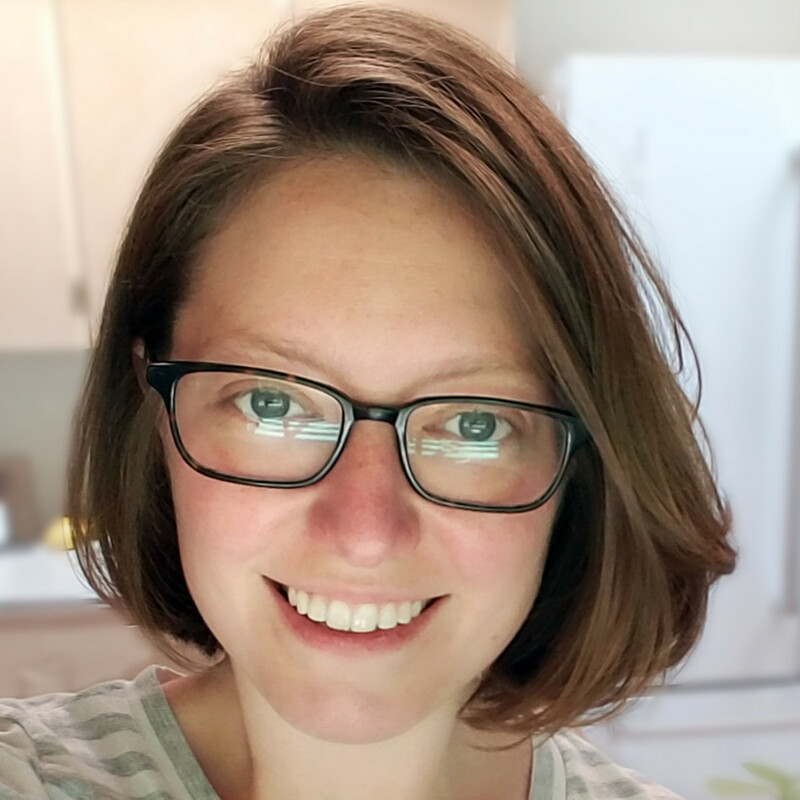 Thanks a lot for sharing your story ! Hi Caroline! What a great find. I did not sand it, but it would probably be a good idea to! I am debating this right now. I need an island hood. My appliances are all ivory. My hardware is all antique brass or bronze. Trying to find an island hood in any of these colors automatically places me at $2,000+! Ugh. I am tempted to try this but I fear my lack of artistic ability may lead to streakiness or uneven color. With this being an island range…it will be a focal point and counter seating will be up close. I knew I couldn’t be the only one that had thought about this. I’m finally getting to remodel my kitchen. I’ve always loved the look of copper and believed that one day I would have a range hood made out of it. Until I saw the price tag….no way! What do you think? Would painting a stainless steel hood with a good copper spray paint look legitimate? If it didn’t turn out, is there a way to remove the paint? Wow this looks great! I am thinking of doing the same thing– except spray painting a black hood white. Question: how did those switches/buttons hold up with the spray paint? Did that mess up any of their functioning? I ask because I actually spray painted my toilet paper holders– and some of the paint got onto the plastic spring-loaded toilet paper insert and they actually got stuck and would not longer expand/contract! It’s not a big deal because they’re cheap and easy to replace, but I’d hate to mess up the functioning of my range hood. Did you simple spray paint over the buttons and no problem? Thanks for posting this– so helpful! Oh no! 🙂 Yes, good thing they were inexpensive. I did paint right over the buttons on this one and made sure to lightly push them in a few times as soon as it was dry enough to touch, and there was no problem with sticking on mine. As far as the underside went, I covered all sensitive areas with painters tape. Glad it’s helpful! We loved ours and will probably do it again in our new house. Looks great. I am considering doing the same but my only concern is whether it would start to show marks and dirt easily being white? How has yours held up? Thanks Sophie. It held up beautifully for the 3 years we stayed there, and we cooked daily. I just cleaned with a slightly soapy dishcloth every once in a while.